In Residential Treatment of Adolescents, Pazaratz discusses how practitioners can remain emotionally available for the needs of their residents without feeling overwhelmed. Readers will be apprised of ways to deal judiciously with residents who try to circumvent, con, play workers off each other, and even attempt to seduce or manipulate the worker. Each chapter instructs readers to observe their clients and comprehend how they relate to the total environment, in order to determine what the resident is feeling and how he or she makes use of personal resources. This contextual understanding helps to answer questions such as: What are the youngster’s goals? What factors obstruct the change process? What are the youngster’s defenses and against what? How does the youngster use the milieu (staff and peers) and the community as resources? How can the youngster get significant others to react differently to him or her? 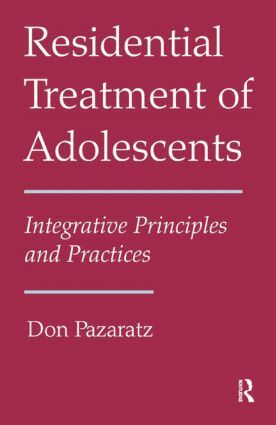 Ultimately, Pazaratz demonstrates that effective treatment staff do not create dependent youth, make treatment oppressive, or enact a role based upon giving consequences. Instead, the reader will learn to integrate diverse intervention strategies into the resident’s normal cycle of daily life and how to interact within a team structure.